The swept-wing F-84F evolved from the straight-winged F-84 Thunderjet. The first prototype flew on June 3, 1950 and deliveries began in 1954, primarily to the Tactical Air Command as a ground support fighter-bomber. Republic Aviation built 2,112 F models while General Motors fabricated an additional 599 aircraft. Of these, 1,301 models were delivered to NATO air forces. The F-84F had the swept wings, a more powerful engine, an enlarged engine intake and a different canopy. Production of a reconnaissance version, the RF-84F, totaled 718 aircraft, including 386 for allied countries. The RF-84F featured engine air intakes at the wing root and cameras in the nose. 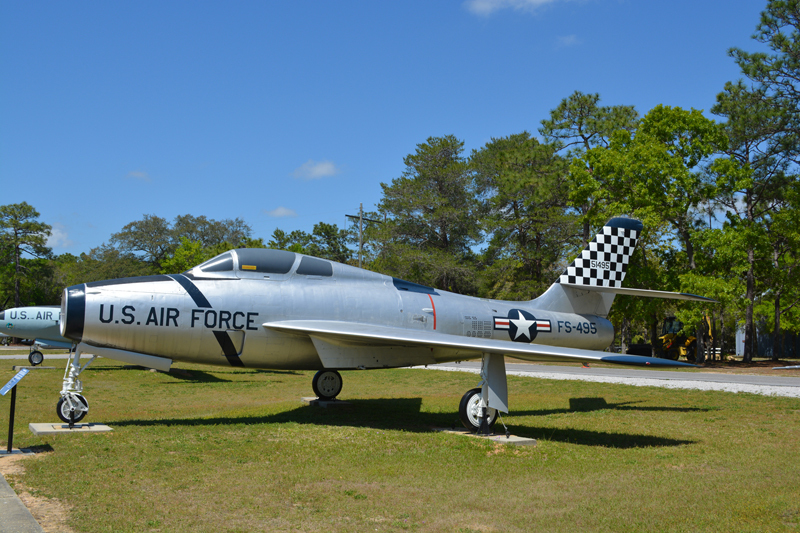 F-84Fs were gradually replaced by the supersonic F-100 aircraft in the late 1950s and were turned over to the Air National Guard units. However, some F-84s were called back to temporary USAF service in the early 1960s due to the Berlin Crisis. This aircraft S/N 51-9495 is depicted in the 401st Fighter-Bomber Wing’s colors, the 401st FBW was stationed at England AFB, LA and had deployments to Eglin AFB, FL. The F-84F brought stardom to the 401st when they participated in the filming of the “The McConnell Story”, eight aircraft were painted blue with MIG-15 markings to simulate enemy aircraft during the Korean conflict in the aerial combat scenes of the movie.